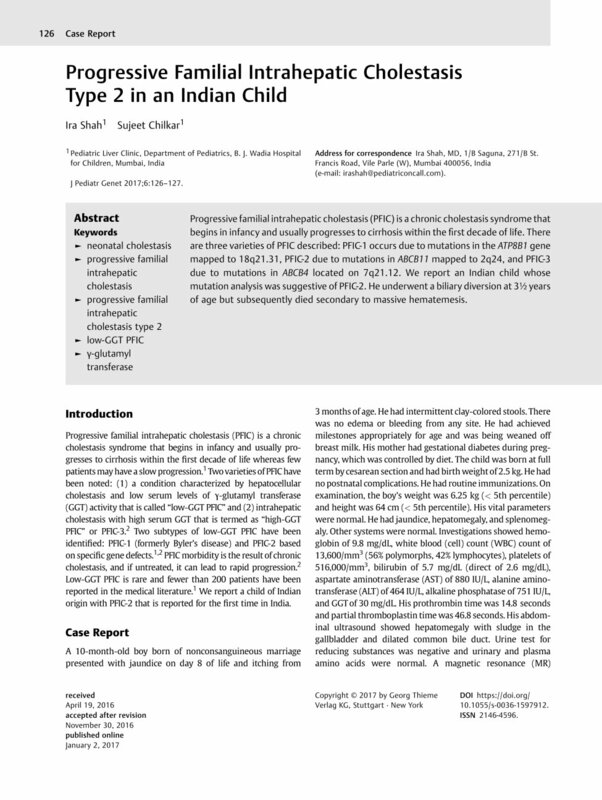 Progressive familial intrahepatic cholestasis (PFIC) is a chronic cholestasis syndrome that begins in infancy and usually progresses to cirrhosis within the first decade of life. There are three varieties of PFIC described: PFIC-1 occurs due to mutations in the ATP8B1 gene mapped to 18q21.31, PFIC-2 due to mutations in ABCB11 mapped to 2q24, and PFIC-3 due to mutations in ABCB4 located on 7q21.12. We report an Indian child whose mutation analysis was suggestive of PFIC-2. He underwent a biliary diversion at 3½ years of age but subsequently died secondary to massive hematemesis.